Novus staplers are the preferred choice among professionals throughout the world. These heavy duty clinchers are capable of continually stapling large quantities of paper with minimal effort. Designed and developed in Germany, they will exceed your expectations and improve efficiency in the workplace. The novus B50 has a capacity of 140 sheets, and features an automatic bypass system that provides the convenience of using larger staples on smaller projects. A sliding adjustable Depth guide allows you to set the staple location and ensures you hit the mark on every document. The B50 is German engineered and features an innovative anti-blocking system (ABS). this prevents the possibility of a jam and wrestling with your documents once they are stuck to the stapler. A dual staple guide further ensures trouble free performance by providing even pressure on the staple legs until they Clinch your documents. No more jammed fingers that often occurs from spring activated, top loaders. 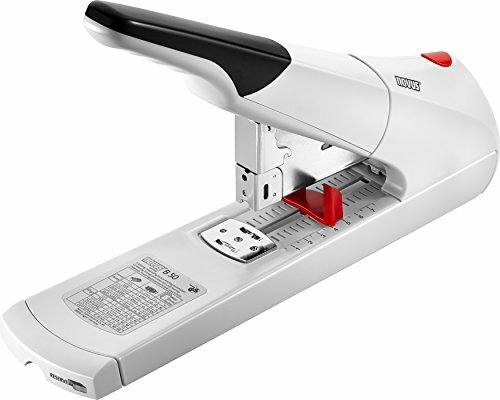 The novus B50 is a front loading machine that is easily refilled by pushing the Red button at the back of the stapler. For optimal performance, we recommend using novus heavy duty #23 staples. These thicker gauge, precision formed staples will ensure your stapler performs as designed. The B50 will accommodate staples up to 17mm in length. If you have any questions about this product by Dahle, contact us by completing and submitting the form below. If you are looking for a specif part number, please include it with your message.